Welcome to another interview with Mikel and Dilara of Feline Minds! Wait, don’t give up on one cat because your other cat seems to hate him. I’ve struggled with this problem myself, and others have asked about it, so I am very grateful to Mikel and Dilara for sharing their wisdom on the topic. I will definitely be using their advice next time. When someone has two cats who hiss and fight, what are the first couple things to try? If these are cats who are new to each other, they should be housed separately so that they can be introduced slowly. If these are cats who previously co-existed peacefully but are now fighting, the separation is important because both cats may need to calm down. This scenario is most common when there are triggers causing redirected aggression (such as cats hanging around doors and windows outside, or when one cat returns from the vet smelling differently). You might start by rubbing each cat down with a clean sock or washcloth and let the other cat sniff and explore it, while getting some treats simultaneously. If that goes well, the next step might be giving treats to both cats near the closed door of one cat’s “safe room,” and then next with the door cracked slightly, gradually working on supervised time together. Do you have a couple tips for preventing this problem before it ever starts? “Our mantra – a slow introduction! 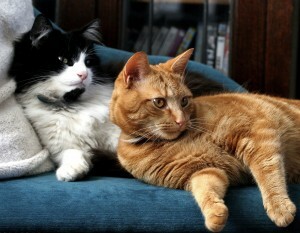 Give the new cat a safe room and give both cats plenty of time to adjust to each other. You can never really go too slow, but people often get impatient and go too quickly. It can be very frustrating to live in a home where you have to do a slow introduction and keep doors closed, but preventing bad encounters will pay off in the long run. Giving the cats LOTS of treats and positive experiences when they are near each other will give them reasons to like each other (more so than just getting hissed and growled at will!). This seems like a particularly tough one to me–is it harder than most behavior problems? “Sometimes it feels like it! 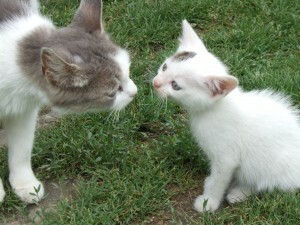 One important factor is how compatible the cats are – old cats and teens don’t always mix well, for example. Some cats are just more tolerant of other cats, or have had more exposure to cats during their sensitive socialization period. Others seem to be more territorial. Cats by nature are solitary hunters, so it is possible that they haven’t had to evolve a complex social structure where they ‘need’ to cooperate. In the wild, cats tend to congregate over resources (mainly food). One big issue is that often by the time you try to fix this problem, the cats have already had several bad encounters. A study by Levine, Perry, Scarlett & Houpt in 2005 found that initial meetings between cats that involved fighting were highly associated with continued fighting up to 12 months later. This demonstrates that a bad introduction can make the problem much harder to solve down the line. Introducing another cat or new baby? Preventative counseling at a reduced rate. They can help you select your new cat or create a smooth transition with introductions. Great ideas! 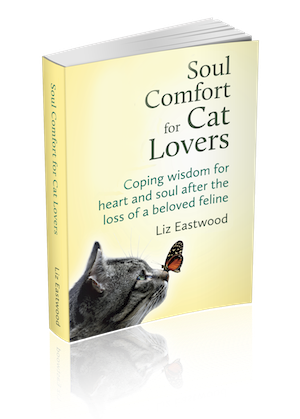 I am thinking of getting a kitten as a companion to my senior cat and this was very helpful. This winter I rescued a stray 2 yr old female cat that was sleeping outside in the snow. She has been in our attached heated garage for over a month during which time she has been vetted and spayed. She is very sweet and appreciative. I am trying to decide if I should try and keep her or find a good indoor home for her. My indoor 9 year old spayed female cat and I are very bonded (more so than any animal I have had). I rescued her at 5 weeks old and she is my pet soul mate. She wants to be with me and be held a lot, which I like. She is aware the new cat is in the connecting garage through the door and the new cat has been in a few times in the carrier and loose. The new younger cat seems to come in prowling for my cat and growls at her. A couple of times that cat has chased my older cat which causes her to yowl loudly and run under the bed. Another time I saw my cat shaking. My cat seems afraid of it. I have fostered younger kittens in the past and she was curious and playful with them. I don’t know whether I should risk upsetting my purrfect lovey cat or causing behavior problems. Any thoughts would be appreciated. I inherited a cat when my mother died last year. She is one of those who prefers to be the only pet in the household. We have one large 15-yr-old dog, a new puppy 10 weeks old, a rabbit, and an adult cat who has always initially disliked but worked out the relationship with other cats until this one. The new cat moves into one room and stays there. She won’t use the litter box and we have had to throw out some things because we couldn’t get out the smell. Right now she is living in our bedroom.It isn’t trashed quite as bad. Yet. The 2 dogs sleep in the bedroom. The other cat has always come in a few times during the night to check on things. Simi (our cat) needs only poke her head around the door and Felecia (my mom’s cat) starts hissing at her. Unfortunately when you challenge Simi she doesn’t back down and we have hissing and yowling and actual 2am fights. Felicia is getting thinner and her coat is not as full and shiny. At times there are patches of fur missing. She has developed scabs under the fur. Getting rid of her, unless she went to a home I knew wanted her and would be good to her, is not an option. But that means that being the only pet is not an option for her. She has gotten to the point where she tolerates the dogs, although she will hiss at them once in awhile. I don’t care if the cats like each other. I would be happy if they would ignore each other and tolerate each other. And I realize that Felicia had a major upheaval. I can’t do anything about that. This situation has been going on since November 2012. I don’t know if a consultation is possible, but if you could give me some ideas I would be very grateful. I always attempt to follow tips with our cats but I’m only 14 and my dad likes to move fast and won’t let me do it my way. He wants to tape up all the cats’ feet and put them in front of each other but I tell him it doesn’t work. Is there anything that could change his mind? What?! He wants to tape up their feet?! He will absolutely traumatize then for life. Is this a joke? If it’s not, I highly suggest talking to your father about the proper treatment of animals. It sounds like he has a lot if learning to do. Thank you Kerry! I couldn’t agree more. The tape thing, aside from being inhumane, will backfire big time. Cats will associate the trauma experience with each other and who ever did it to them. Oh and I would like to study to be a veterinarian once I go to college. Are there any tips or anything that you could think of for me? I agree that cats should be introduced slowly and carefully with positive experiences such as treats. The amount of time it takes varies with each situation. Tuna works well, but is very rich and contains a large amount of mercury. It’s fine in small amounts on occasion though. We give a little to our cats once in a while. Canned tuna cat food is better than pure tuna. Good point about cat furniture providing needed extra vertical space and having multiple litter boxes. It’s also good to have multiple sleeping areas. Cat beds make for good sleeping areas. Also, a large living space with several rooms and more than one floor helps quite a bit. Allison, oh boy, you are in a tough spot with the separation strategy not being an option. I can imagine your 5 year old may prefer to be the baby of the family, and it sounds like he takes particular issue with this new cat. It’s strange when you see that side of a normally sweet cat, isn’t it? At least the flower remedy helps.That may be a clue. If you get desperate perhaps exploring more of those—like Spirit Essences or Anaflora–may help even more. Also, have you tried creating more vertical cat space (trees, climbing areas)? Adding a litter box? If none of that makes a big enough difference, I would resort to an animal communicator. It’s definitely a “woo woo” thing that’s not for everyone, but I have to admit I’ve tried it and been amazed how it effective it can be. I’m glad you also weighed in on Feliway–so it doesn’t *always* work… good to know. This good advice. I like using pheromones in products like Feliway and Comfort zone lowers stress levels for a easier adjustment. I also recommend distracting the two cats with a game using a fishing rod type toy with enough space in between to feel safe (at least six feet apart and gradually bringing the two closer together. I make my own out of a long bamboo stick, ribbon and catnip toy tied to the end. More great tips. Thanks Layla. I love that I keep hearing voluntary recommendations of Feliway from a variety of people. It must really work. – Another great thing to get two cats to get along is giving them catnip ( cat herbs) it makes them more playful and loveing, it could “break the ice” between the cats. Thanks Mathias. I like your catnip tip too. I need to remember how helpful catnip can be. Someone was telling me it also helped her CRF cat’s appetite.